“I am obliged to inform the people of Tamil Nadu that I decided to contest in the R.K. Nagar by-election on my own and without influence of any political party or any individual whatsoever, but only with pure intentions to serve the people from the bottom of my heart. The rejection of my nomination paper was totally unethical and unjustified and the events that followed are there for all the people of Tamil Nadu to see and understand that democracy has been buried to ground. In this hour, there are much bigger issues like Kanyakumari fishermen issue for us to support and concentrate on than me contesting in the by-election. I request the State government to give top priority in this regard to find the missing fishermen. Let us all join together to lend a helping hand to search and bring back the lost Kanyakumari fishermen to their families and loved ones. 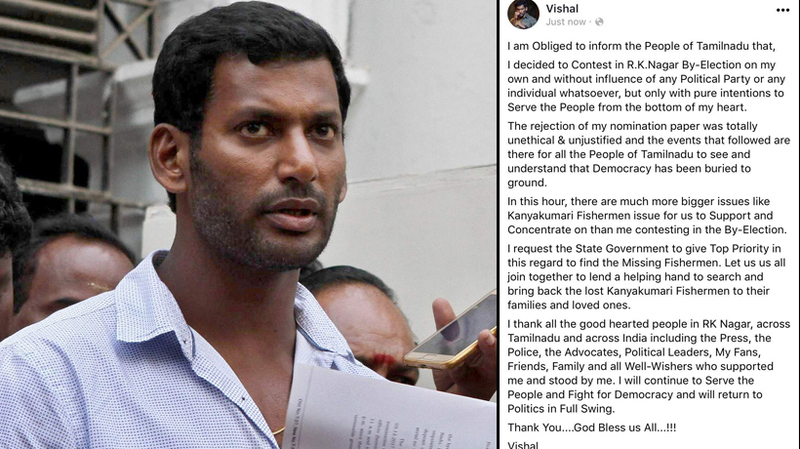 I thank all the good hearted people of R.K. Nagar, across Tamil Nadu and across India including the press, the police, the advocates, political leaders, my fans, friends, family and all well-wishers who supported me and stood by me. I will continue to serve the people and fight for democracy and will return to politics in full swing.